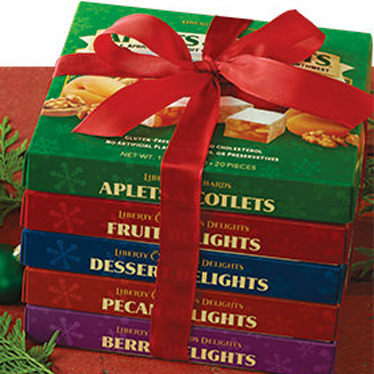 A selection of our best-loved candies, boxed for the season! 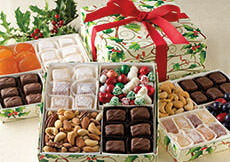 We've taken five of our most popular candy assortments and lovingly hand-packed them into our festive "Snowflake Boxes" just for the holidays! Choose from our Three-Box Stack with the 10-oz. 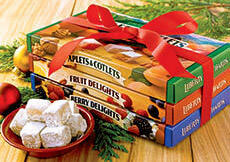 Aplets & Cotlets, the 10-oz. Fruit Delights, and the 10-oz. 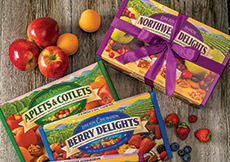 Berry Delights...or choose our Five-Box Stack with those three boxes plus the 10-oz. Pecan Delights and the 10-oz. Dessert Delights! Arrives tied together with a beautiful red bow. Kosher. Gift wrap not available for these items. INGREDIENTS, Aplets & Cotlets: sugar, corn syrup, walnuts, modified corn starch, fruit juice from concentrate (apple, apricot), pectin (pectin, disodium diphosphate, sodium polyphosphate, dextrose, dicalcium phosphate), natural flavors, sodium citrate, citric acid, malic acid, soy lecithin. INGREDIENTS, Dessert Delights: sugar, corn syrup, nutmeats (almonds, pecans), modified corn starch, fruit [fruit juice from concentrate (apple, cranberry, cherry), cranberries, candied orange peel], pectin (pectin, disodium diphosphate, sodium polyphosphate, dextrose, dicalcium phosphate), natural flavors, sodium citrate, citric acid, malic acid, soy lecithin. ALLERGEN INFORMATION: Contains nuts and soy. May contain traces of peanuts and tree nuts not listed in the ingredients. INGREDIENTS, Fruit Delights: sugar, corn syrup, nutmeats (walnuts, pecans, almonds, macadamias, cashews), modified corn starch, fruit [fruit juice from concentrate (strawberry, peach, blueberry), candied orange peel, pineapple], pectin (pectin, disodium diphosphate, sodium polyphosphate, dextrose, dicalcium phosphate), natural flavors, sodium citrate, citric acid, malic acid, soy lecithin. ALLERGEN INFORMATION: Contains nuts and soy. May contain traces of peanuts and tree nuts not listed in the ingredients. 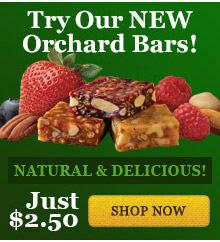 Our macadamia nut candies include a small amount of cashews. INGREDIENTS, Pecan Delights: sugar, corn syrup, pecans, modified corn starch, fruit [fruit juice from concentrate (peach, apple, cherry), cherries, apples], pectin (pectin, disodium diphosphate, sodium polyphosphate, dextrose, dicalcium phosphate), natural flavors, sodium citrate, citric acid, malic acid. INGREDIENTS, Berry Delights: sugar, corn syrup, fruit [fruit juice from concentrate (blueberry, strawberry, boysenberry, raspberry, cranberry, apple), cranberries, blueberries, blackberries, raspberries], nutmeats (walnuts, pecans), modified corn starch, pectin (pectin, disodium diphosphate, sodium polyphosphate, dextrose, dicalcium phosphate), natural flavors, sodium citrate, citric acid, malic acid. ALLERGEN INFORMATION: Contains nuts. May contain traces of peanuts and tree nuts not listed in the ingredients.